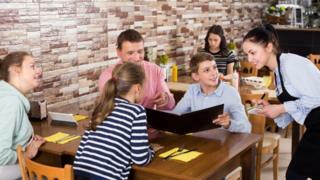 Over half of Britons who holiday abroad admit to having pointed at a restaurant menu to avoid having to pronounce non-English words, a survey shows. And almost half said they were embarrassed at not being able to speak the local language while away. But 80% of more than 1,700 people questioned for the British Council felt it was important to learn some phrases. “Trying out a few words is the perfect way to get started,” said Vicky Gough, British Council schools advisor. The Populus survey found 37% of British holidaymakers always tried to speak a few words in the local language but 29% said they were too scared to try. A minority (15%) admitted to being so unwilling to try pronouncing words from other languages that they would only eat in British or fast food restaurants while overseas, rather than sampling local cuisine. A similar number said they preferred staying in self-contained resorts to avoid local culture. “It’s great that many of us are willing to have a go at speaking the local language while overseas,” said Ms Gough. “It’s a meaningful gesture that will help you get the most from your holiday. “But too many of us are still relying too heavily on English alone. And, if this means we’re missing out on holiday, imagine the effect that our lack of language skills is having on the UK more widely. “The reality is that having more of us being able to speak at least a little of a foreign language is good for the UK’s long-term competitiveness, particularly as the country comes to reposition itself on the world stage. “Speaking other languages not only gives you an understanding of other cultures but is good for business and for life too. Around one in six of those polled said they could speak a foreign language to a high standard and just over a third could hold a basic conversation. Previous research by the British Council, the UK’s international culture and education organisation, has found that the UK has a shortage of people able to speak the 10 most important world languages, which is likely to hamper the country’s future prosperity and global standing.